Everyday, I take a walk. It's good for health, I think. While I wear sneakers, Beijing factory owner Zhang Fuxing wears iron shoes. Each shoe weighs over 440 pounds... each. 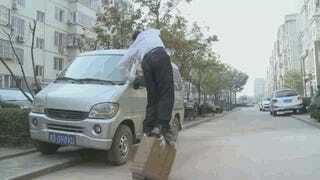 Zhang has been wearing his iron shoes to walk 15 meters for the past seven years. He tells AP (via SCMP) that the iron shoes made his back feel better and credits the Chinese spiritual martial art of qigong for his ability to walk in the shoes. Next year, Zhang plans to add another hundred pounds. Of course he does! Zhang is such a believer in iron shoes that he's even started manufacturing them and hopes to sell them. I'll just stick with my sneakers, thanks.